The Quanta 200 FEG scanning electron microscope (SEM) is a versatile high resolution scanning electron microscope with three modes of operation, namely, the high vacuum (HV) mode for metallic (electrically conducting) sample, low vacuum (LV) and environmental scanning electron microscope (ESEM) modes for insulating, ceramic and polymeric (electrically insulating) samples eliminating the need for a conducting coating used for conventional HV mode SEM. 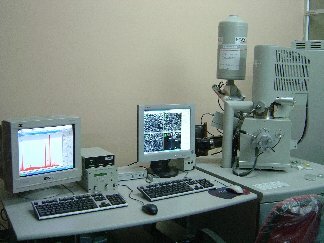 Apart from giving the high resolution surface morphological images, the Quanta 200 FEG also has the analytical capabilities, such as detecting the presence of elements down to Boron (B) on a thin film materials through the energy dispersive X-ray spectrometry (EDX) and providing crystalline information from the few nm depth of the material surface via electron backscattered diffraction (EBSD) system attached with it. Detectors Conventional Everhart-Thornley detector (ETD) with variable grid bias for HV mode. * 3 rd generation large-field gaseous secondary electron (SE) detector (LFD) for LV as well as ESEM mode, mounted off-axis, and with enhanced gain preamplifier suitable also for use at low voltages. * Standard gaseous SE detector (GSED), axially mounted, and containing integrated second 500 micron pressure-limiting aperture for operation up to 40 mbar for ESEM mode. Vacuum System The Quanta 200 FEG can be freely switched between three vacuum modes. For imaging and microanalysis of conductive and/or conventionally prepared specimens. For imaging and microanalysis of non-conductive specimens without preparations. For high vacuum incompatible specimens. Tilt eccentric at analytical working distance of 10 mm. Image media Digital images are displayed in an area of 1024 x 884 pixels, configurable for single frame display or 4-quadrant display on a 17’’ LCD monitor and can be saved in TIFF, BMP or JPEG file formats.